“Some of You Standing here will not taste Death”–Matthew 16:27-28 explained! The army in the clouds in A.D. 66. Was this the second coming? Preterism, Matthew 16:27-28 Explained: The Second Coming mirrors Past Events recorded in the Bible in which God appeared to People. 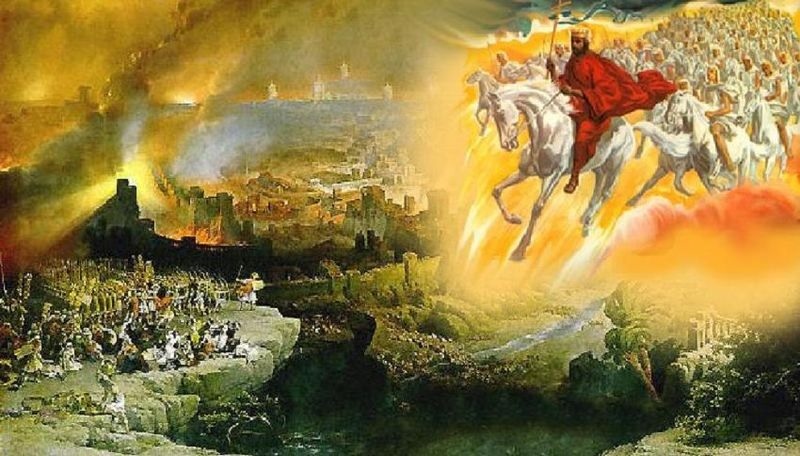 One might expect that when people see Jesus, the Son of Man, coming on the clouds of heaven during His second coming that this appearance would be similar to previous events in the Bible in which God had come on the clouds. When people think of the second coming, they often think of a single, brief event; however, the Bible is a book full of types and multiple fulfillments. The “second coming” appears to be no exception. The second coming or parousia as it had been fulfilled through the various miraculous appearances of Christ in A.D 66, A.D. 70 and A.D. 79 is a first century climactic repetition of the various ways in which God manifested Himself throughout Old Testament history. Dore, Gustave. The Army Appears in the Heavens (2 Maccabees 5:1-4). The coming of Christ on the clouds with a myriad of angels in A.D. 66 mirrors the coming of the Lord as it is described in Deuteronomy 33:2: “The Lord came from Sinai and dawned over them from Seir; he shone forth from Mount Paran. 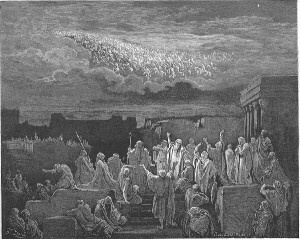 He came with myriads of holy ones from the south, from his mountain slopes.” The parousia of A.D. 66 as it is recorded in Wars of the Jews and Histories is also identical to an event seen in the sky at the start of the Maccabean revolt in the second century B.C. according to 2 Maccabees 5:1-4. This coming of Christ in the presence of an army of angels in A.D. 66 seems to explicitly fulfill Matthew 16:27-28 in which Christ was expected to come in the presence of the angels of heaven. For a detailed description of this aspect of the second coming see Jesus, the Son of Man, was Seen in the Clouds in A.D. 66. For a detailed explanation of the other appearances of Christ during the Jewish War see Historical Evidence that Jesus, the Son of Man, was LITERALLY SEEN in the Clouds in the First Century. 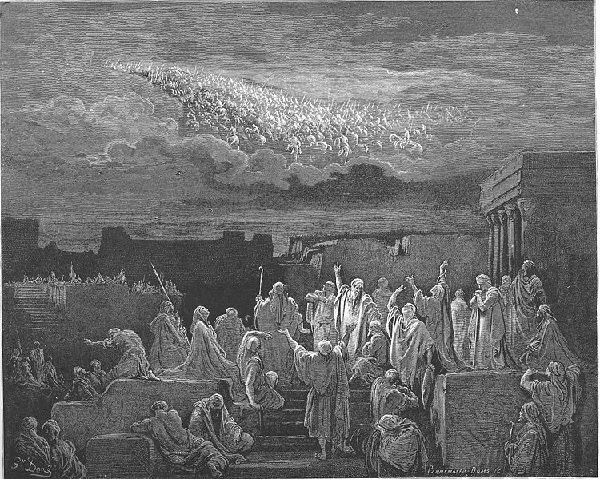 An artist’s portrayal of the army of angels in the clouds in A.D. 66. Realized Eschatology and Matthew 16:28: “Some of You Standing here will not Taste Death”: Though Christ was visible during the Parousia of A.D. 66 mentioned above, the coming of the Kingdom of God on Earth was Not according to Luke 17:20-21. In v. 28 Jesus says, “[S]ome who are standing here will not taste death before they see the Son of Man coming in his kingdom.” Though Christ was visible during the parousia of A.D. 66 mentioned above, the coming of the kingdom of God on earth was not. In Luke 17:20-21 Jesus says, “The kingdom of God is not coming with signs to be observed; nor will they say, “Look, here it is!’ or ‘There it is!’ For behold, the kingdom of heaven is in your midst.” In other words, the kingdom of heaven is the body of Christ representing Jesus and His people, the saints. This is why in the presence of His disciples, Jesus says that “the kingdom of heaven is in your midst.” The spiritual and therefore unobservable nature of the kingdom of God is also echoed in 1 Corinthians 15:50: “[F]lesh and blood cannot inherit the kingdom of God.” So what did Jesus mean when He said, “[S]ome who are standing here will not taste death before they SEE the Son of Man coming in his kingdom”? Covenant Eschatology and Matthew 16:28: “Some of You Standing here will not Taste Death”: Having conquered Death at His Coming, Those Who were Alive During and After the Second Coming would be immediately raised to Life without experiencing Death (i.e. consignment to Sheol) First. These People would Literally See the Son of Man in His Kingdom at the Resurrection. In my vision at night I looked, and there before me was one like a son of man, coming with the clouds of heaven. He approached the Ancient of Days and was led into his presence [in heaven]. He was given authority, glory and sovereign power; all nations and peoples of every language worshiped him. His dominion is an everlasting dominion that will not pass away, and his kingdom is one that will never be destroyed. As depicted in Daniel 7:9-14, this coronation is in heaven where Jesus rules the world from a heavenly throne. Therefore, those whom Jesus said will see this event are those who were resurrected to heaven at the end of the age. But why does Jesus say that “some who are standing here will not taste death” before they see this coronation? Revelation 21:4 says that in the New Jerusalem “death shall be no more.” This is because according to 1 Corinthians 15:50-54, Jesus conquered death. The death that Jesus conquered was spiritual death which is separation from God. Before Jesus died for the remission of sins, the Old Covenant saints had no sacrifice for sin to purge them from the curse of spiritual death. Thus these saints were confined to Sheol, the dark underworld of death, after biological death. Sheol is spiritual death because it is a realm of darkness and separation from God in heaven. Sheol is often translated death in the Bible. This is not a mistranslation. Sheol is death, specifically spiritual death or separation from God in heaven after biological death. 1 Corinthians 15:51-52 says, “We will not all sleep, but we will all be changed—in a flash, in the twinkling of an eye, at the last trumpet. For the trumpet will sound, the dead will be raised imperishable, and we will be changed.” 1 Corinthians 15:51-52 appears to be describing the resurrection of spirits out of Sheol at the last trumpet. Those who are asleep in v. 51 are spirits in Sheol that are raised to new life in heaven. These verses suggest that during and after the resurrection at the last trumpet, many people will no longer be imprisoned in the darkness of Sheol before resurrecting from the dead. These people will be “changed” meaning that they will be given their resurrection bodies immediately after death presumably without being trapped in Sheol first. Therefore, spirits that died before the second coming would be consigned to Sheol and thus experience death before being resurrected, but those who died during or after the second coming would be immediately raised to life and literally see Jesus in His kingdom or coming in His kingdom as indicated in v. 28: “I tell you the truth, some who are standing here will not taste death before they see the Son of Man coming in his kingdom.” See 1 Corinthians 15:50-54: A Preterist Commentary, How the Resurrection Bodies of the Saints Perfectly Mirror Jesus’ Resurrection Body after His Ascension Into Heaven Fulfilling Philippians 3:20-21 and ALL Other Bible Verses on the Resurrection!!! and The Notion that the Resurrection is an Earthly Phenomenon whereby the Dead are raised as Perfected, Eternal Earthly Bodies is dispelled by 1 Corinthians 15:35-50 and Isaiah 65:20. As explained in Matthew 16:27-28 explained! “Some of You Standing here will not Taste Death” it appears that many people alive during Christ’s ministry did not die before seeing Christ come on the clouds in A.D. 66.